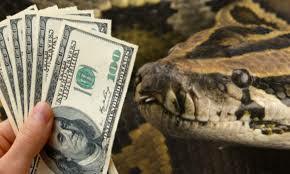 Home Opinion What does it say about us that even our Snakes now 'swallow' money? What does it say about us that even our Snakes now 'swallow' money? The excuse given by the head of the Jamb office in Makurdi, after 36million Naira was found missing in the branch, was that it was a spiritual attack perpetuated by her househelp, who colluded with other staff in the office, and sent a snake, who swallowed the money. That is preposterous to be mild. In what sane country is that even an excuse? And what does it say about us that somewhere, someone, paid to look after our commonwealth, would even dare come out with such an excuse? I still believe the excuse is a more apt manifestation of our country. It gives credence to the saying that "a people deserve the leaders they get." While the excuse is pure fiction mixed with a whiff of the stupendous, the reality of money missing in an official setting is only too rife in this clime. As a country, this is who we are: a bunch of corrupt individuals looking for their next swindle; and hoping to not be caught doing so. It is a game of numbers, really, and it makes sense that in a country where the average is corrupt, then numbers wise, one of the corrupt ones has a higher chance of getting to the submit of political office. And as you can guess, they would aim to line their own pockets first and the citizenry would only be an afterthought. It is a reality we shouldn't turn a blind ear to. It is who we are. In Yoruba, the term for embezzlement literally translates as "swallowing money," so we shouldn't be surprised that our animals have taken after us.